Occasionally a book comes a long that becomes so entrenched in your brain that it continues on long after you finish reading the last sentence of the epilogue. 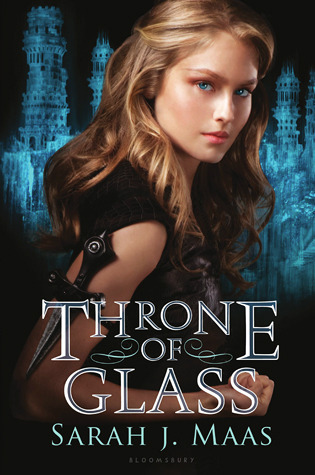 For me, Throne of Glass and the heroine Celaena Sardothian are such creatures. It is a fantasy adventure novel along the lines of Kristin Cashore and Tamora Pierce. Celaena will quickly find her deserved place among the modern strong female heroines such as Katniss, Tris and Katsa. When Throne of Glass begins Celaena is serving a life sentence in the brutal salt mines. The average life expectancy of its inmates is one month. A year later Celaena is still alive when the Prince approaches her with an interesting proposition. Become his champion in a competition to become the King’s Champion (otherwise known as the King’s Enforcer), the same king who sentenced her to her current fate. From young age Celaena had become her country’s most infamous and feared assassin. Then at seventeen she was betrayed and found herself at the King’s mercy. The prince offers her a chance to free herself from a certain death in the salt mines and eventual freedom. Celaena is the type of character who could have been easily unlikable. She is arrogant, vain, competitive and blunt. But in Maas’ hands, she becomes intriguing and memorable. She knows she is the best, but she trains extremely hard to live up to her own expectations, which far surpass what anyone could demand of her. She has to swallow her vanity in the competition when she has to pretend to be someone other than she is when she would rather have everyone cowering from her reputation. She views her environment in detail, noting every avenue of escape or method of defeating her opponents. In a lot of ways the manner in which she presents herself to everyone is a façade; a lie she even tells herself, unwilling to even think about the tragic past, which Maas only alludes to. But then there are moments of vulnerability, loneliness, and fragility scattered throughout the pages that give you glimpses of Celaena’s true self. I could go on and on about how much I love this book, but it is something that you need to experience yourself. Celaena, Choal, Dorian, and the other cast of characters have dug their way so deep into my psyche that I can’t seem to get the buggers out. The book is in paperback this month and the sequel is due out later this year, so I definitely recommend picking them up. I almost bought this yesterday! I’ll definitely have to pick it up now 😀 Thanks for the review!